Our pattern generator and stepper upgrade kits usually run as standalone, real time controllers. The steppers and pattern generators reside in semiconductor fabrication cleanrooms so there are advantages to allowing for remote control of the machines from locations outside these cleanrooms. These notes describe how to implement remote operation of the stepper or PG using freely available software and a network supporting the IPX protocol. It is assumed that the PG/Stepper upgrade kit is running DOS 7.1 and that the user has a licensed copy of DOS 7.x as part of Windows 95/98/98SE/Me. Download the 'Netop for DOS' host and client software (now freeware but no longer available on the netop.com website) from here (the zip password is 'netop'). 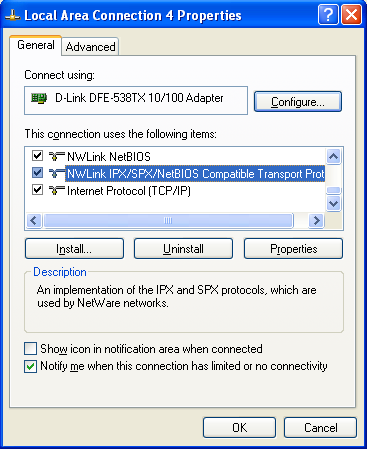 This command names the host controlled machine as 'ned', assumes the IPX protocol and specifies that the host should broadcast it's name on the network. 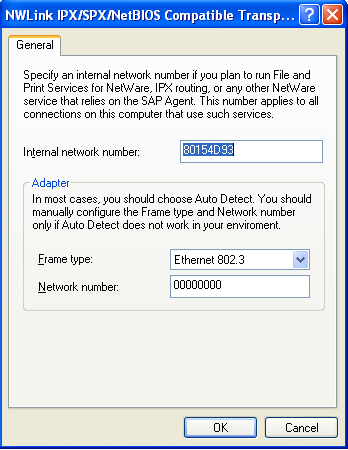 On the client machine (the networked computer outside the cleanroom), download and install the 'VmWare Player' virtual machine software from here (the download is free but registration is required). 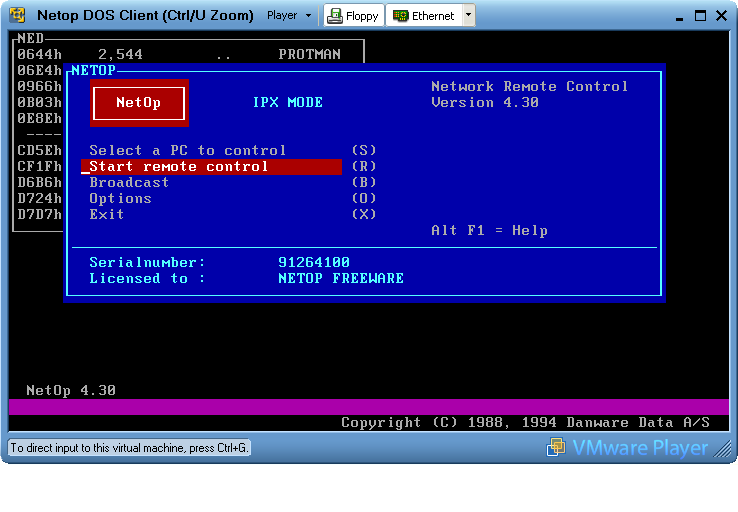 For the client machine, we have created a .vmx configuration file and a small (2 Meg) .vmdk disk file. They are available in ZIP format from here. 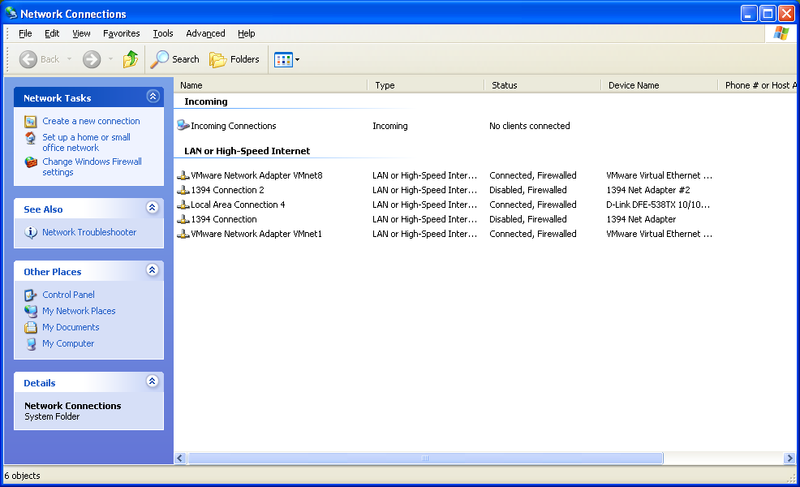 These files create a small DOS virtual machine running DOS 7.1 (Windows 98SE DOS) with IPX network support. 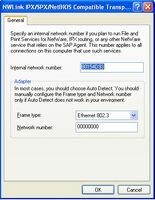 The Netop client software runs immediately upon powering up. 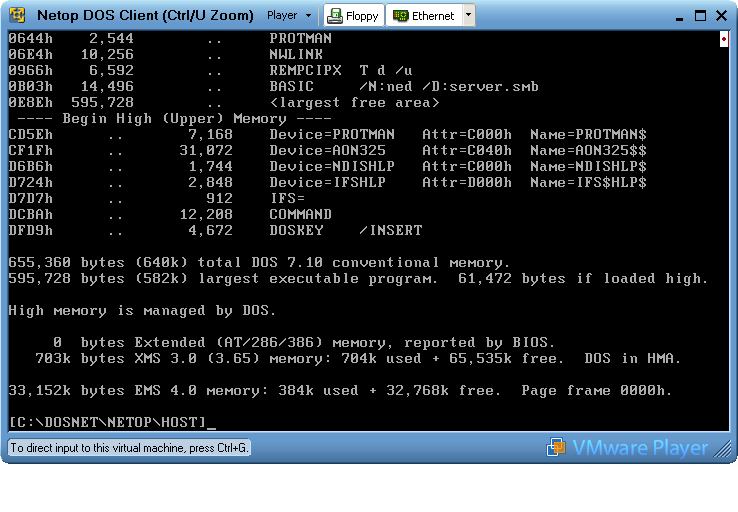 Note that DOSIDLE and SPEEDVM are included in the virtual machine so that it does not take 100% of the CPU i.e. 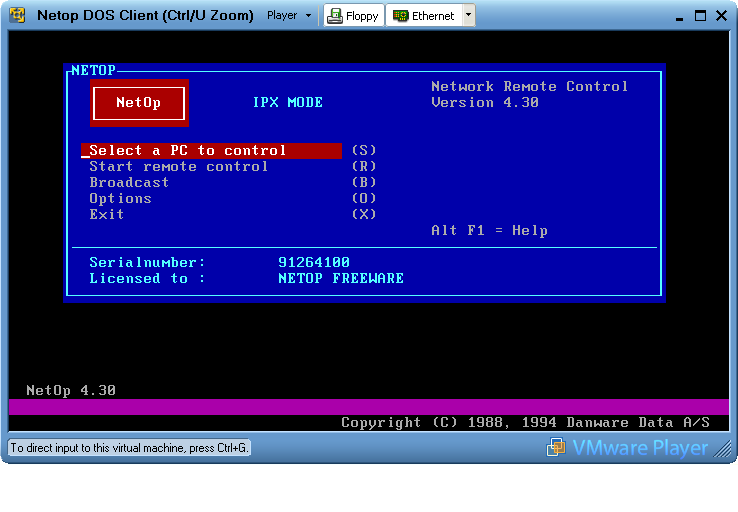 other tasks can run when the DOS virtual machine is idle. For those who don't have a licensed copy of Win98SE DOS, we have also created a .vmx configuration file and a 1.44Meg .vfd (virtual floppy disk) file. This configuration runs Datalight's ROMDOS (free for personal use from here) along with Microsoft MS Client (available free from here). This virtual DOS machine is available in ZIP format from here. As above, DOSIDLE (SPEEDVM isn't necessary with ROMDOS) is included in the virtual machine so that it does not take 100% of the CPU when idle. 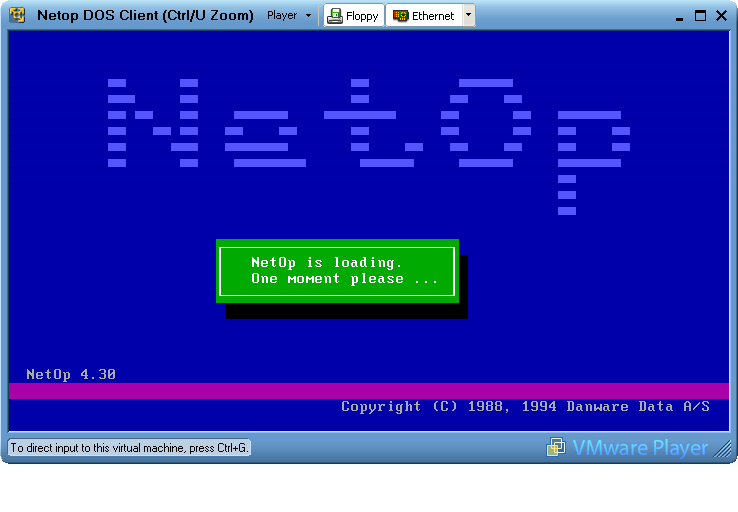 Sample screen images for the Netop client software, running in a DOS virtual machine under Windows XP, are shown below. Once connected to the remote machine, the user can press [Ctrl-U] to toggle between a full screen view and a modal window view (the default 'zoom screen' hot key [Ctrl-Z] was redefined to [Ctrl-U] since [Ctrl-Z] has a function in DOS). The [Alt-F1] help menu will only appear in a modal window view (not full screen) so the only active hotkey sequence, when running in full screen mode, should be [Ctrl-U].